This is the second installment in our new series on Random Acts of Kindness. Each week a different blogger will share about a day that they and their little ones dedicated to committing random acts of kindness. 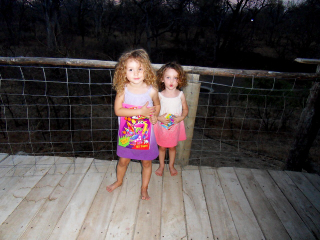 This week’s post comes to us from Mud Hut Mama, who shares about her Random Acts of Kindness Day in Malawi, where she lives on a wildlife preserve with her husband and two daughters. Visit the main Random Acts of Kindness Challenge page for a full schedule of the posts in this series. When Leanna sent out the invitation to join her Random Acts of Kindness month I loved the idea of it and I wanted to participate but even as I accepted the invitation I realized that it would be a little tricky for us. In the States a random act of kindness is generally accepted with surprise and gratitude but, in the context of Malawi, it becomes a lot more complicated – at least for me as an expat navigating a foreign culture. In this part of the world there is a lot of jealousy and you have to be very careful about what you do for one person if you are not doing it for everyone. If people start to think one person is being favored and they become envious of that person it is very likely that someone will do something to put them back in their place, and this can take the form of witchcraft, which is very real to many Malawians. In addition to that, the history of blanket aid in this part of the world has often led to an expectation of handouts from foreigners and there is sometimes a sense of entitlement to those handouts, so I worried that bigger gestures such as passing out large amounts of food to the needy in Blantyre (our closest city) might turn into a bun fight. This is not to say that there are not random acts of kindness that take place every single day in Malawi because there are and I could fill post after post with descriptions of the compassion and kindness that I have seen in this part of the world. The challenge is that this project is to take one day and do a number of random acts of kindness which in many ways makes those acts less random than if you do what is more common here and offer help when you see that it is needed or when it is asked for. That is more my style but I liked the idea of focusing an entire day on kindness so I decided to use it as a learning experience for my littles and to keep it simple, keep it local, and keep it culturally sensitive. I wanted most of our acts of kindness to be things that the girls could replicate on a regular basis so that when they see us doing for others we can remind them of what they did and hopefully encourage them to do additional acts of kindness. This was somewhat complicated by the fact that we live in the middle of a wildlife reserve and don’t come into to contact with many people on a daily basis, but we found out that there are always opportunities to spread a little kindness. My daughters are ages two and three so we chose a Friday for our day of kindness. This gave us the entire week to prepare. 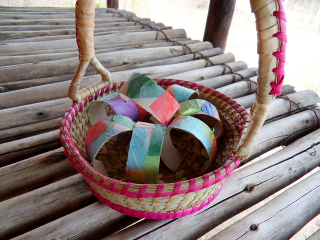 Many of the crafts and cards were made in advance with just a final touch added on Friday. This provided a lot of time to talk about what we were doing and why. By Friday the littles were excited to spend a day doing things to make people (and their environment) happy. I started the day by making a homemade coffee cake for my family. They love the very rare occasion that we have cake for breakfast. As we were enjoying the coffee cake I told the girls that my act of kindness to them was that it was going to be a day of no time outs and that I promised not to raise my voice for the entire day. I was pretty proud of myself for keeping that promise and have vowed to repeat it more often. We made long distance hugs to send off to the littles’ grandparents – one set is on its way to Botswana and the other to the United States. 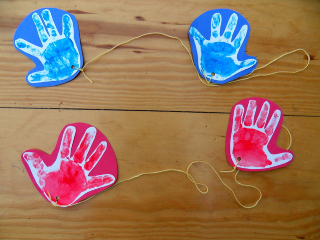 We found this craft at Tons of Fun and added our own cards that read: These long distance hugs are made with our very own handprints, we measured our arm spans with the string so when you wrap our arms around you, you will know exactly how big our hugs really are. We can’t wait to squeeze you tight in person but we hope these hugs will tide you over until we see you next. For Dada the littles practiced singing the song he likes to sing to them, an old Jam song that he inserts the girls’ names into. 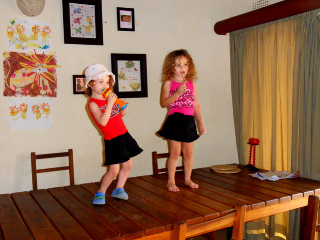 When he came home for lunch we pulled out our microphones (errr one microphone and one whisk) and used the table as a stage to perform for him. It made him very happy! 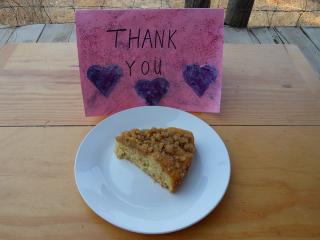 When our housekeeper, Saliyapa, arrived for work she was greeted with a thank you card and a piece of coffee cake. She was able to enjoy her cake while the littles and I washed the dishes to show that we appreciate what she does for us. I regularly go through the girls’ toys and books and donate anything they have outgrown or are not using to a local orphanage but I have always done this when they are sleeping and have then distracted them when they realize something is missing. On this day I told them that it would make another child happy if they gave them one of their toys or books. I asked them to each pick out just one toy or book that they would like to give to another child. I was expecting tears and refusals since I had recently cleared out our shelves and there wasn’t much left that doesn’t get used regularly. I was shocked that instead of crying they ran to their shelves and decided on their notebooks. They love to “write” in their notebook and thought another child would like them as well. I told them that was a good idea but that since they had already used a lot of the pages in the notebooks maybe another child would prefer something else. They then decided on their books and surprised me again by choosing seven books to donate instead of just one each as I had suggested. Two of the books were all time favorites. I was so touched that they wanted to do this and Boo even asked if she could help me wrap them up so that the children could open them like presents. We decided to go play with our friends who live just outside the reserve and we made a special American treat to share, Chocolate Chip Cookies. That brought an awful lot of smiles. We made these cute and easy friendship bracelets that we found at DIY Life. The girls each ended up with four bracelets. They exchanged with each other and gave the rest to some friends they have in town. 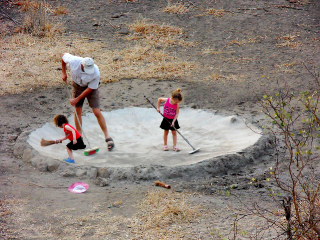 Dada brought the girls down to the waterhole to give it a good clean before filling it up again so that our four legged friends could have a nice clean drink of water during this hot time of year. He then had to go out to collect elephant dung (they are DNA fingerprinting our elephant population) and he took the girls with him. As is our usual habit, they stopped to pick up any trash they saw and talked about why keeping the reserve free of litter would make the animals happy. 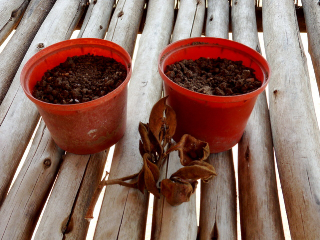 We collected some sterculia seeds and planted them. We talked about how important indigenous trees are and why planting them and protecting them would make the earth happy. There was a bit of an ulterior motive here as the girls have just started learning to identify trees and Boo has said that what she really wants for Christmas is a sterculia tree. If we have any luck with our seeds her wish might just come true, otherwise I’ll have to put a bow on one of the sterculias near our home. Although I was hesitant to join in at the start, I am so glad that we participated and that Leanna forced me to really consider ways that my daughters, even at their young ages, can spread kindness and happiness. It has had a wonderful effect as they are now asking me on a daily basis if certain things make people happy. The other day when Boo finished her dinner without it being a fight she looked up at me and asked, “did that make you happy?” and Kooks helped Saliyapa with the sweeping and asked if “that made her happy?” Thank you Leanna for spreading so much kindness! 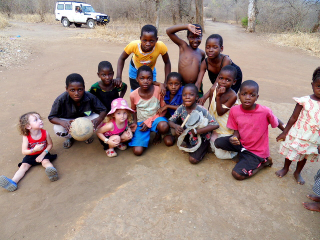 Jody is a stay-at-home mom, raising two girls in a wildlife reserve in Malawi. Pre-motherhood she worked with international and environmental education. 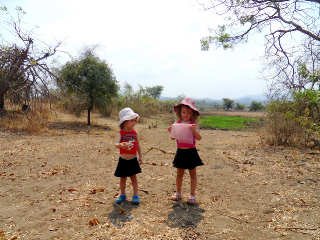 Jody is homeschooling her daughters and enjoys sharing her love of other cultures, nature, and conservation with them. She writes about their adventures at Mud Hut Mama. You can also visit Mud Hut Mama on Facebook, Twitter, and Pinterest. Watch for a post next week from Bilingual Babes! You can see a full schedule of the posts in this series by visiting the main Random Acts of Kindness Challenge page. That was such an enlightening and beautiful post. So glad I saw this and will pin it. Have a great day! So many ways to be kind! Thanks for sharing! On another note, can you get chocolate chips there? We can’t here in Ecuador. Thanks Mari. No we can’t but we substitute chopped up chocolate bars – not exactly the same taste as semi-sweet chips but still pretty yummy. WOW, well done Jody what an amazing piece. Hows that for thinking outside the box. I shyed away from this one thinking I’d have to approach random strangers to do something. I was not sure how that would go down in London. You have shown me that we can do caring acts for our family and close friends. I really like the long distance hug :0) I’ll take a note out of your book for that one and send my mum one for Xmas :0) I really enjoy your posts. Thanks so much. I have to admit that it took me a while to realize that we should stay local. I kept thinking we should go to town and do for the homeless and/or visit the orphanages but in the end I think this was best for the ages my girls are at. This is such a lovely idea, I think people forget about being kind sometimes. Not because they are bad people but because they get caught up in the rush of every day life. And kindness doesn’t have to be a big thing to make a big impact. Lovely post. So many awesome ideas here. Love the long distance hugs. Would love a bite of that coffee cake! Ah Jody, this was such an interesting blog post… I was especially intrigued, and I admit quite scared with the whole “jealousy, and witchcraft”, and I’m happy you decided to participate with a different approach. 🙂 I really loved that Boo wants sterculia tree for Christmas! How wonderful is that! No toys, but a tree! That is sweet! Thanks for sharing and thanks to Leanna for starting this series! Thanks Frances – I also think it is really sweet that she wants a tree – of course she also wants a guitar, a drum and flute! Jody, these are such great examples spreading happiness and doing it so your littles can (and want to!) participate. You’ve inspired me to focus on spreading happiness in our neighborhood. Thank you Lynda – we had a lot of fun with it. So many wonderful activities! Chocolate chip cookies are wonderful anywhere, anytime, aren’t they! Definitely MaryAnne – I don’t think you can go wrong with chocolate chip cookies! 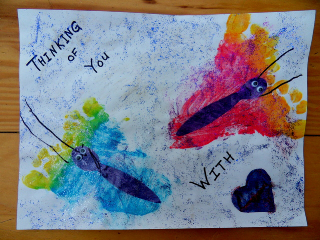 What a thoughtful and sensitive approach to the day, so many wonderful ideas and each one really involving your littles! So lovely that they ended the day by wondering if others were happy. Right… off to google a sterculia tree now..!